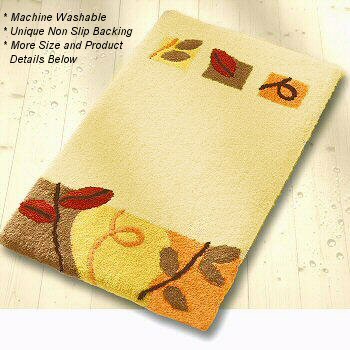 Sand Beige:Sandy beige rug with brown, yellow and rust/orange with brown and deep cranberry leaves. Brandy: Rich deep brandy color with brown, beige and rust/orange with brown and deep cranberry leaves. Palm Green: Medium tone green with deep green, light yellow and yellow orange with leaf green and medium green leaves. Platinum: Classic color with just the right design flare. Platinum grey with accents of black, winter white, dark slate grey, dark steel grey and silver grey. Idyll elongated lid covers have a single box with a leaf in the center of the lid cover. The elongated lid covers coordinate with each rug swatch.